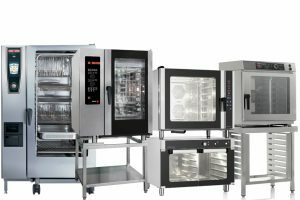 OVENS: KARAMANIS SA collaborates with foreign companies such as FAGOR, RATIONAL, DISTFORM and UNIVERSAL and imports forfessional ovens in order to cover the needs for all catering outlets. Convection ovens analogic or digital, gas or electric, steam or with humidity, with slow cooking system. With wide range of additional accessories to cook with sous vide or even to smoke the food. Silent, ubiform cooking and energy saving.